Supernova Mario World Engine is Supernova's third Mario engine, and the first to not use Gamemaker's built-in collision detection. During the early stages of the engine, it was very similar to Hello's engine. However, due to the many strong criticisms towards Hello Engine exerted by many members, supernova began to code his own scripts. 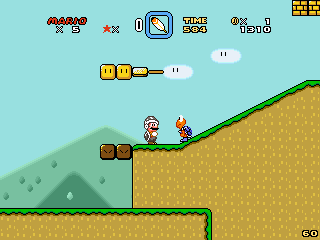 In Summer 2011, Supernova renamed it the "Supernova Mario World Engine". It features enemies and physics based off of Super Mario World, as opposed to Hello or DrageezeY's engine's being based primarily off of Super Mario Bros. 3. In July 2012, due to its lack of proper syntax, disorganized code, and large amount of bugs, Supernova released the final version of the engine and cancelled it. This page was last edited on 21 March 2015, at 00:24.